When Shaimaica Ferguson’s new baby, Amani Early, gets a little older, she’s in for quite a story about the day she was born. Ferguson called out for her mother to dial 911 and paramedics rushed her to her local hospital in Catawba County, northwest of Charlotte. She was then transferred to Novant Health Forsyth Medical Center in Winston-Salem, more than an hour away. In one way, the timing of her heart attack couldn’t have been worse: She was 34 weeks pregnant. 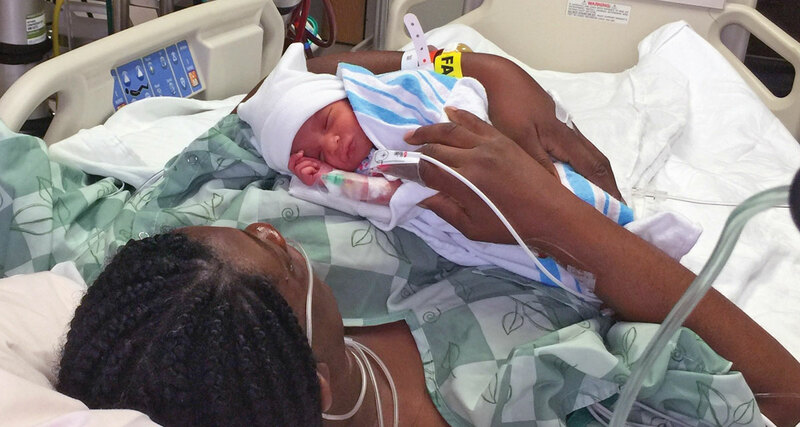 In another, it was perfect: Forsyth Medical Center had just started using a procedure that could help save the life of both mother and baby. Extracorporeal membrane oxygenation, known as ECMO, is a treatment for patients with a wide variety of heart or respiratory conditions that do not respond to the intensive care usually used. With ECMO, blood from the patient is run through an artificial lung, where oxygen is added, and carbon dioxide is removed. The blood is then returned back to the patient. Essentially, the treatment can give doctors an advantage because it provides the heart and lungs a rest as high-risk work is being done on the patient. The hope is that the body will be ready to take back over the action on its own. Forsyth Medical Center is unique in that most nonacademic hospitals don’t offer ECMO on-site, along with having the ability to handle the whole course of treatment. Ferguson was going into shock already by the time she arrived at Forsyth Medical Center. And as her condition deteriorated, she had to be placed on a ventilator to assist with her breathing. “Her heart almost gave out, then baby gave out,” Lee said. “They had to do a C-section on the bed in the ICU. The baby did OK; then we rushed mom down to the operating room. That’s where the decision was very tricky: she had heart failure, pulmonary edema, active bleeding….” A wide-ranging team of specialists and nurses were tending to her situation. While Ferguson has a very calm presence normally, at the time, she said, there were some incredibly frightening moments, especially when realizing what her baby must have been going through. Relief washed over her as boyfriend Thomas Early explained that their baby was in the NICU. But Ferguson wasn’t yet out of the woods. Doctors explained to Early and Ferguson that she had just a 50-50 chance of survival with traditional treatment. The best hope was ECMO, Lee confirmed, but there were no guarantees. While Ferguson was on the ECMO machine with her life still hanging in the balance, Amani was brought in for skin-to-skin contact with her mother. Ferguson’s condition was later traced to heart problems that ran deep in her father’s side of the family. Her late brother and father both had heart conditions. While Ferguson will have to continue to be monitored, she now has a chance to have a long, healthy life, Lee declared. And Amani now has two big sisters herself and a big, loving family. Novant Health is proud to be the American Heart Association’s “Life Is Why and Go Red For Women” Sponsor in Forsyth County, celebrating all women in Forsyth County, supporting women wherever they may be in their journey, and encouraging women to put their health first. For more information, visit www.NovantHealth.org/heartmonth.